Missing teeth affect your life in so many ways! When you don’t feel comfortable talking and smiling freely it takes a toll on your confidence. When you can’t chew and eat the foods you normally enjoy, your diet and nutrition suffers. When you’re missing one or more of your teeth it’s always on your mind. 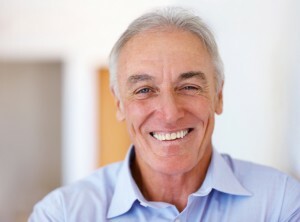 Your Oklahoma City dentist talks about dental implants vs dentures as replacement options for your missing teeth. A dental implant is one of the best options for replacing one or a few missing teeth because it replaces both your root and your tooth. A post made of titanium replaces your root, while a crown made of porcelain replaces your tooth. Titanium and porcelain are both durable, bio-compatible materials that will naturally complete your smile and last for many years. Your titanium root is surgically placed into your jawbone where it’s allowed to heal and integrate with your bone. After the appropriate healing time has passed, your dentist will attach a custom designed crown to your root through an abutment. Now your dental implant is complete and will be just like your natural tooth. You’ll be able to brush, floss, bite and chew just as you were used to doing before you lost your tooth. The best part about a dental implant is that your new root protects the integrity of your jawbone by keeping it stimulated and healthy. Without a replacement, your bone begins to resorb, or lose density. This puts your remaining teeth at risk, and also changes the appearance of your face, giving you a sunken or sagging look that ages you. A denture is a removable appliance made of acrylic that completes your smile with prosthetic teeth. Dentures stay in place through suction and a snug fit, or a dental adhesive. For traditional denture wearers there is a learning curve that goes along with eating and talking as they’re first getting used to their dentures, however dental implants can be used to provide a more secure fit and greatly reduce the learning curve. With implant supported dentures, two dental implants are placed on your upper and lower arches. These implants create a stable foundation, and after the healing time your denture is able to snap into the dental implants so your denture will not move or slip while you eat and talk. Your denture can still be removed for cleaning and sleeping. If you’re struggling with missing teeth Dr. Joe Isaacson and Dr. Ashley Bledsoe Cook invite you to their practice to learn more about your options for replacement. During a consultation you can discuss your options, learn about the procedures and decide which treatment is right for your lifestyle, needs and budget. We’re here to help you, and our talented and highly skilled doctors will be able to restore function and beauty to your smile no matter which option you choose. Contact our office to learn more about dental implants in Oklahoma City.